Vegetables and Microgreens…the Gateway Drugs? Most South Sounders have attempted growing a tomato or two even if gardening is not their “thing”. We grow our own because there is no comparison between the taste of sweet homegrown vine-ripened tomatoes and the corporate, tasteless tomatoes that double as a salad’s color spot. Beware though. The innocent tomato is the gateway to a world of fresh food addiction. Go big or go small…either way…there are benefits. The Delaney family in Tacoma has decided to go big. They have raised beds full of vegetables and six chickens that provide them with plenty of fresh eggs. It’s working out very well, thank you. “There are numerous reasons why I grow vegetables”, says Emily Delaney. “If I had to narrow it down to one, it would be because harvesting something and eating it the same day feels wonderful. I garden because I like knowing where my food comes from, I like providing for my family. I like teaching my children about plants and health, I like saving money, and getting my hands in the dirt is my favorite way to meditate.” Emily also preserves food but chooses to buy larger quantities of the more difficult to grow vegetables from local farms and farmer’s markets. That way she can experiment with many different veg varieties at home. Not everyone has the room or time to dedicate to a working mini-farm like the Delaney’s but on a smaller scale with a combination of a few containers and several trips to farmer’s markets you too can have plenty of healthy, fresh food. All you need is a few pots with drainage, fertile soil (including some worm castings) and some water. Pests that manage to find the planted containers are easy to eradicate so pests (other than deer) are not a problem. Let the big guys grow the squash, cabbage and cauliflower. Instead grow greens of all kinds, strawberries, potatoes, cherry tomatoes and carrots, all reliable mini crops that love containers. Commercially grown, all five of these contain unless grown organically certified contain pesticide residue, especially the potatoes. The more of these five foods you can grow yourself the better. Start micro greens. The easiest and most satisfying way to grow them is to sprinkle them thickly on top of a shallow container of potting soil. As they sprout and grow, keep cutting them back and using them. Every time you harvest for a fresh salad, you’re stimulating the lettuce to put on more growth. The lettuce never has enough time to get bitter because you’re cutting it back all the time. All you need is a pair of scissors to harvest. Easy. 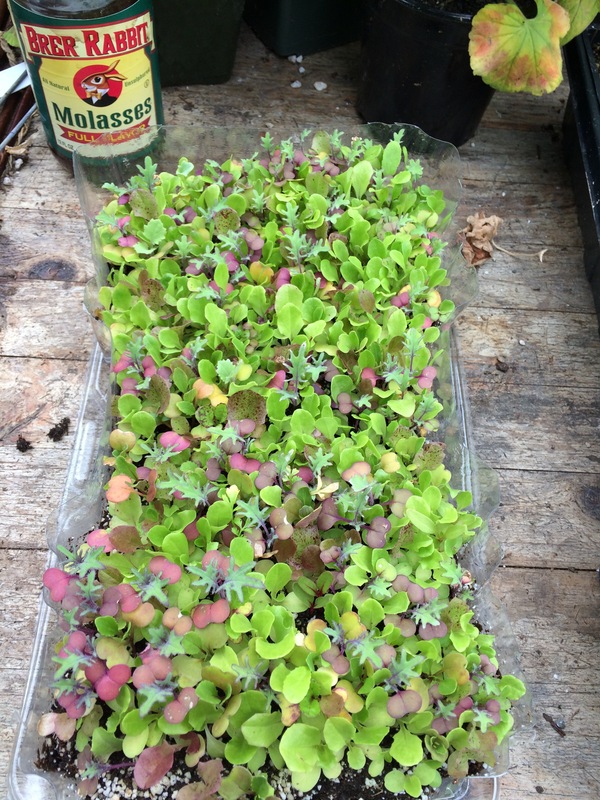 Microgreens in a salad box. Alpine strawberries which can either be bought as a plant or easily grown from seed yield strawberries from April to frost. Yes, they are tiny but they are packed with intense strawberry flavor and bloom and fruit like crazy spring through fall. Fresh strawberries all summer! Kids love these. Delicious and really tiny alpine strawberries…they grow and give you strawberries all summer. Cherry tomatoes are probably the most popular container grown vegetable. No surprise. Unless you have a greenhouse or are really lucky with your seed growing, it’s much better to buy the plants for these. Any “determinate” (compact bush) type will work. Carrots are no trouble to grow in containers. Stay with Chantenay or Nantes type because they are a bit smaller. Carrot seeds are really tiny so mix them with something like sand or powdered milk and sprinkle them on the surface of the container It helps distribute the seeds evenly and cuts down on the thinning you’ll need to do in a few weeks. Carrots are easy to grow and surprisingly fun to harvest. Growing your own fresh food gives you bragging rights. Beware of the gateway farming though. You could end up with chickens too.